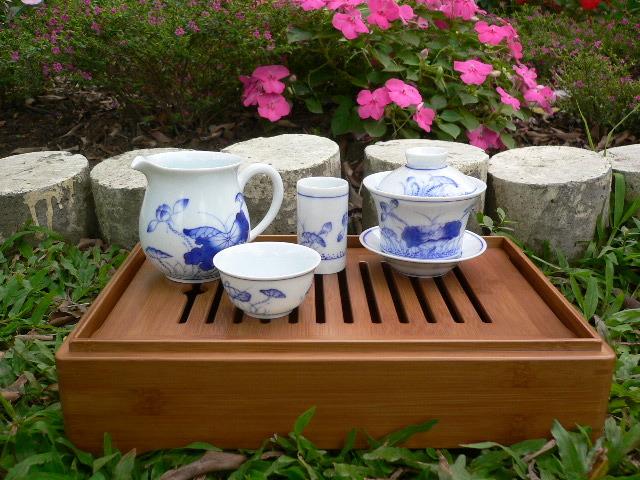 A fellow blog reader recently asked me to look for a medium sized bamboo tea tray. 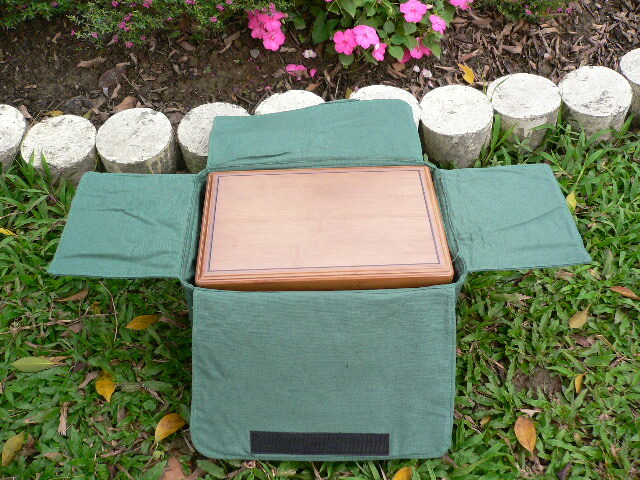 Since she was interested in my pu er, I readily agreed to explore Taiwan's market for bamboo trays. They are mostly produced in NanTou County in a place -wouldn’t you know it?- called Zhu Shan, bamboo mountain. But, like for every thing, there are also lots of Chinese made trays of lesser quality. By the way, last weekend, Taiwan TV news reported that in China even chicken eggs are copied!!! They cost half less to produce! So, as I looked for a nice, Taiwan made, tray, I stumbled upon this beautiful 3 in 1 bamboo artifact. 1. 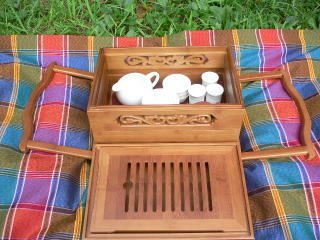 It can be used as a solid basket to carry your tea set (teapot, cups, tea) on a trip. 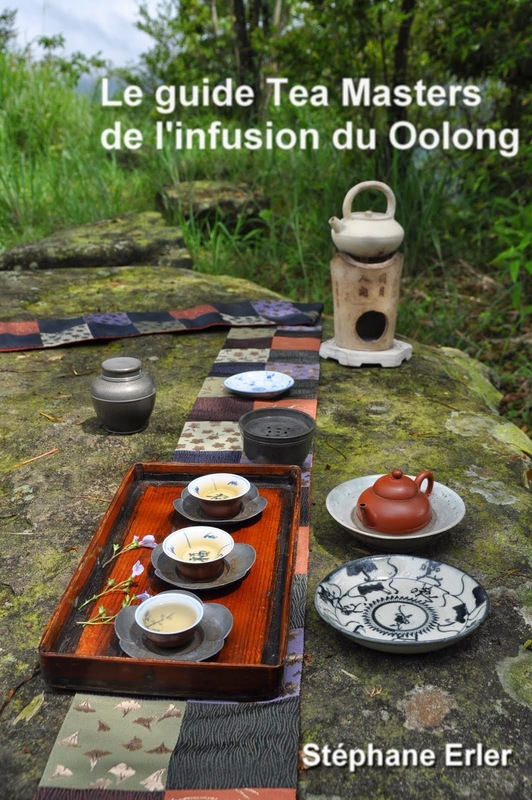 It would be perfect to brew tea, like I did Saturday (this yesterday's post), on top of a mountain or during a picnic. 2. 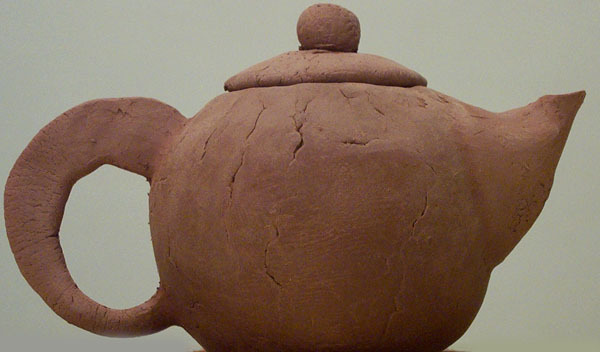 You can use it as a box to gather a few teapots and cups. 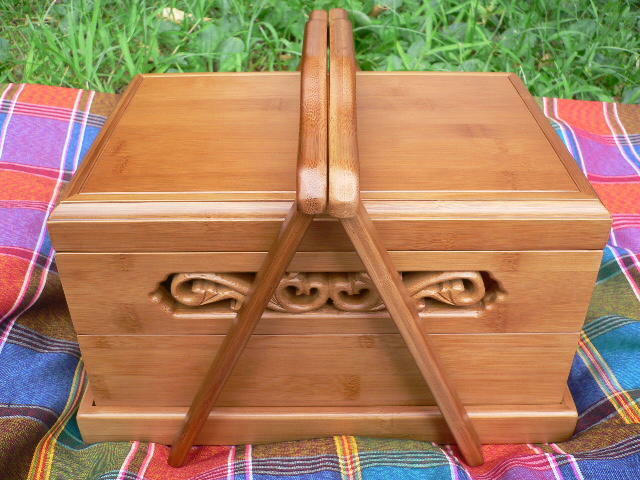 With its nice carvings, you may even want to display the box in your home. It will be very difficult to resist opening it up! 3. And of course, it can be used as a normal tray with filter to brew your tea and with the top to use it as a tray for the guest's cups. 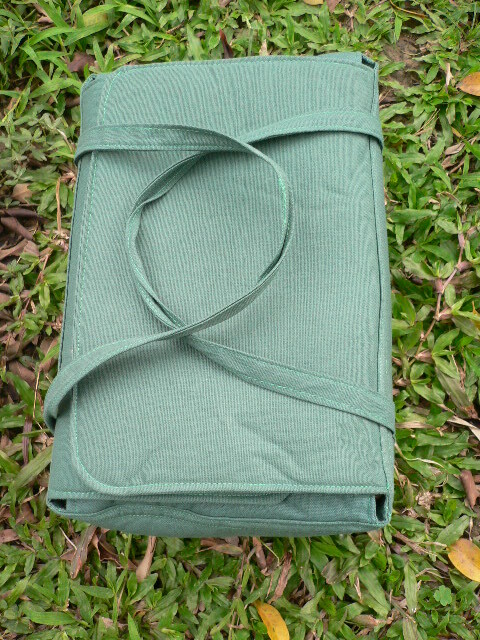 The dimensions are 32 cm long x 22 cm large x 24 cm high. It weighs 2 kg. The carving is a little different, and a black rectangular line has been added on top of the box. :) I don't suppose there were more than one? Intrested in resale? I'd buy! I'm sorry that we're not on an eBay auction ! 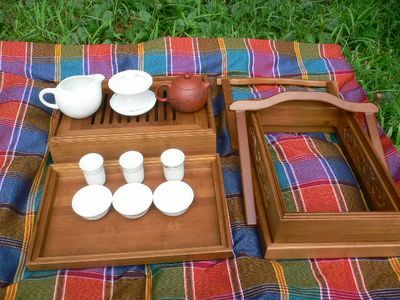 please check with our blog Tea Master how to get your own bamboo tray... this one on the picture is going to settle down for teas on the sea shore in France ! comment for my previous comment which looks ambiguous to me now : I want to say : "sorry, Marlene, but I do not want to resale this beautifull tray !..." I DON'T want anybody to understand that I'm sorry that we're not here on an auction sale... TEA MASTERS is the right place for tasting tea ! Actually, there were more than 1 where I found this one for Sophie. This store buys from its related factory near Taichung and they will produce as long as there is a demand. Please contact me directly if you're interested. It realy is a lovely tray. enjoy Sophie. Good tea, lovely tea tray, and France. Who could want more? tiens ! j'avais écrit un commentaire sur ce post, et il ne paraît pas... est-ce que le nombre de "comments" est limité ? Je vois 2 de tes comments un peu plus haut. Non, il n'y a pas de limite aux commentaires et je n'ai pas encore eu à en effacer. 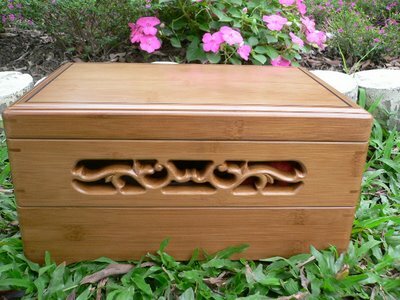 * sharp cutting of the edges : use of sharp tools for shapping bamboo gives soft edges with no splinter at all and no defect in the wood. Check the pattern of the handles, the hole patterns of the removable top tray, as well as the sides and feets of the tray. * perfect assembly of the different parts, use of bamboo pegs rather than glue : the finish of the assembly looks perfect, and the tray is not leaking ! * bamboo little planks look cross assembled, onto 3 layers, and all parts are quite heavy due to high density of the material : this may avoid distorsion of the tray and improve its resistance to wattering and/or dryness. Stephane recommended to me not to hesitate to pour some water onto the tray to keep it moistured ; this makes you drink tea every day ! 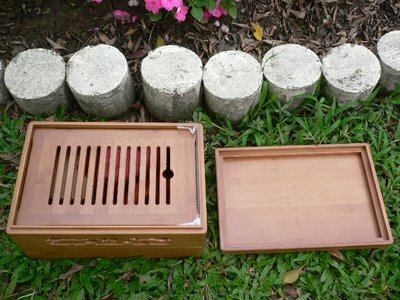 * dark color of the bamboo, regular paterning of the wood fibers and nodes, no cracks, gives a perfect design to your bamboo tray. Bonjour à tous ceux qui s'intéressent à cet objet. Je viens d'en prendre livraison hier matin et malgré mes faibles connaissances en anglais, je rejoins totalement l'avis de SOPHIE concernant la qualité de fabrication de cet objet. Il est magnifique et les assemblages sont travaillés avec une véritable perfection. Il est aussi agréable à regarder qu'à toucher : tout n'est que douceur. Malgré son prix, n'hésiter pas à en acheter un tant que STEPHANE peut en avoir : vous ne le regretterez pas. I am interested in purchasing one of these lovely 3 in 1s. Can you assist me? Please just send me an e-mail at stephane_erler@yahoo.com and I will send you the price and payment method. je ne reviens pas sur la qualité materielle de l'objet, mais plutôt sur son coté fonctionnel: à la fois compact et "contenant", il va me permettre de transporter facilement un peu de vaisselle et de thé en vacances...ou en pic-nic! The box is AWESOME and you're right--your photographs don't do it justice. 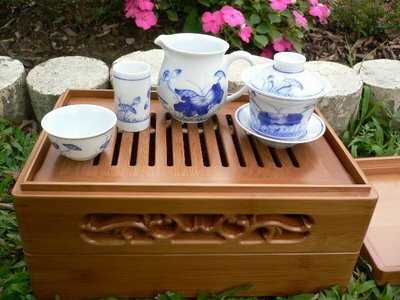 For the benefit of those who are considering the purchase of this beautiful piece of tea art, I'd like to mention that after ordering this, I priced some similar, Chinese-made boxes online. 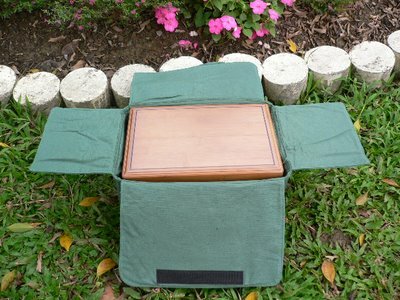 Not only was it evident even from photos that this was in a different class, but the same vendors were selling Taiwan-made trays (i.e., single trays only--no box, carrying case, etc.) for just a few dollars less than their Chinese 3-in-1's, my point being that Stéphane's asking price isn't unreasonable. I'm stunned at how beautiful this is (and though I'm really happy that it comes with a protective tote, I still like that wooden "carrying frame" that came with the earlier model--too bad they don't sell it separately). And for those considering this as a gift for someone other than themselves, it comes in a nice presentation box, to boot. 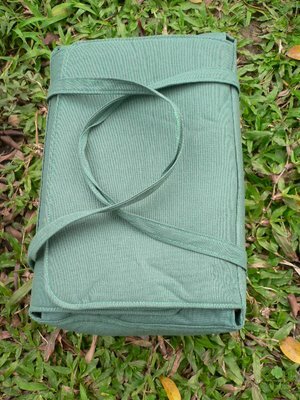 Also for the benefit of all, you mentioned to make sure to use it often and to get it wet to keep it nice and supple. Out of curiosity, would a periodic oiling be beneficial as well? Could it do any harm? Once again, I'm THRILLED with this! Thanks SO much for making me aware of it and offering it for sale! 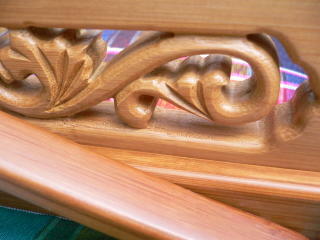 Oiling or, better, specific wax (like bee wax) for wood would be fine. But using it and cleaning it with a soft cloth should already do the trick. Hi Stephanie, I'm interested in this tea tray. 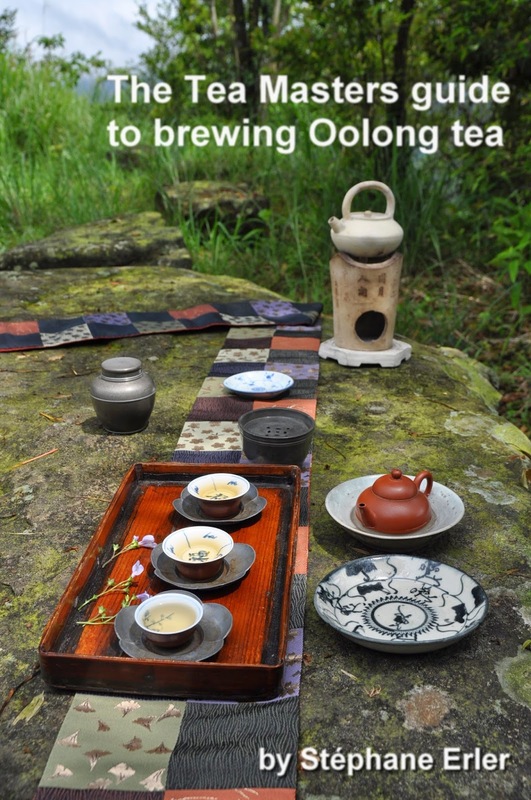 I took a recent trip to Taiwan and visited a tea shop and saw and took part in traditional Taiwan tea preparation and drinking. I loved it! 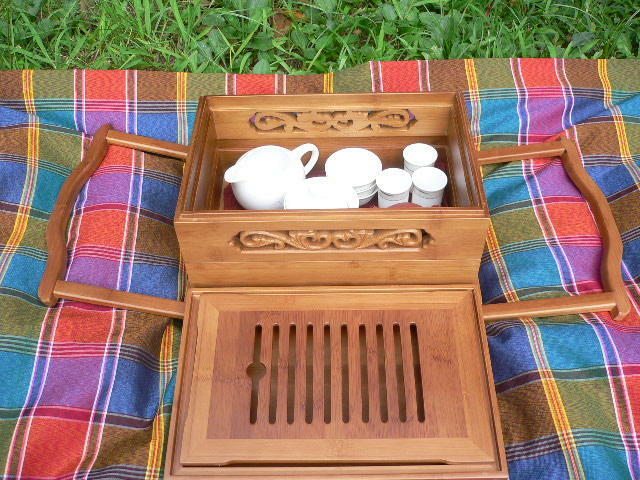 I've been looking for a nice tea tray online (primarily) since. Can you please tell me, is this tea set available for purchase? Thank you.